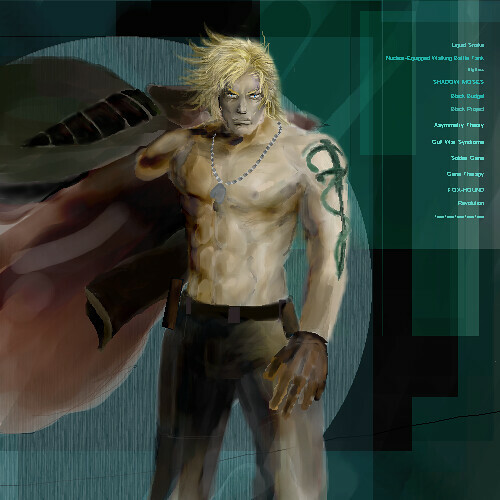 I need to find a good picture of the tattoo Liquid Snake has on his left arm, the one with the snake wrapped around a sword. It can be a pic of the tattoo itself, or possibly a screenshot from either MGS1 or Twin Snakes (preferably Twin Snakes), as long as the tattoo can be seen clearly. I think there's some text above the sword, but it's not important to me to see what it says. The reason why is because I'm thinking of getting that tattoo myself. Now I know, a lot of you guys will probably think "Geez, what a nerd", and granted, fanboy-ism is part of why I want this particular tattoo. But the main reason is that I want a tattoo that symbolises my love for both videogames and the MGS series, because without videogames and MGS, I probably wouldn't be the person I am today. Videogames have helped me through a lot of tough times, relieving stress and helping me shut out the outside world when life becomes rough. And since this tattoo looks both cool and not particularly geeky like many other videogame tattoos, I won't have to explain it to people who just don't get it. Well if you or someone manages to find a decent image of this tattoo I'll be happy to re-draw it for you, so that you can get the proper tattoo! Woah, that sounds great! I'll try to find a decent image! I doubt I'll be able to get the tattoo anytime soon, since I'm currently studying at the university, and a lot of my money goes to new books. But as soon as I have a good pic of the tattoo, I'll head down to a tattoo parlor and try to get an estimated price, then I'll start saving up my money. I found this t-shirt with an image like you described...is this it? If not I'm going to re-install MGS1 for the PC, and try to take a screenshot of the tattoo and see what I can do. I found these two pics drawn by some artists (pretty good ones, found them through Google). And I also found this cutscene from Twin Snakes on Youtube. I think this one shows the best views of the tattoo. I think that there is supposed to be some text above the snake and the sword, but you can never really see what it says, all the close-ups are blurry, so I don't think you're really meant to see what it is. KEEP IN MIND, THE VIDEO CONTAINS SPOILERS FOR MGS1! But I'm guessing that most members on this forum has already played through MGS1 several times already. Just a heads up anyways.